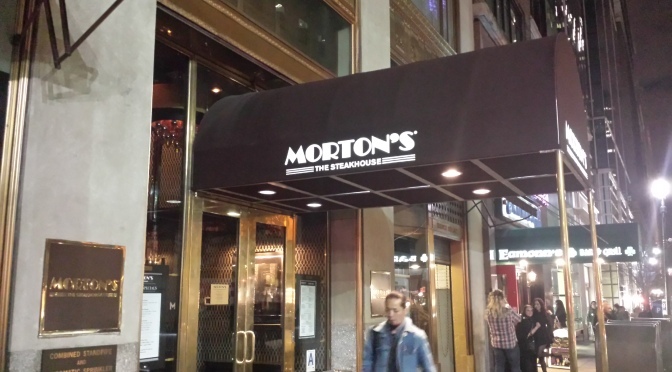 Morton’s was one of my top three favorite steakhouses in NYC, but things have changed since I started reviewing so many places. 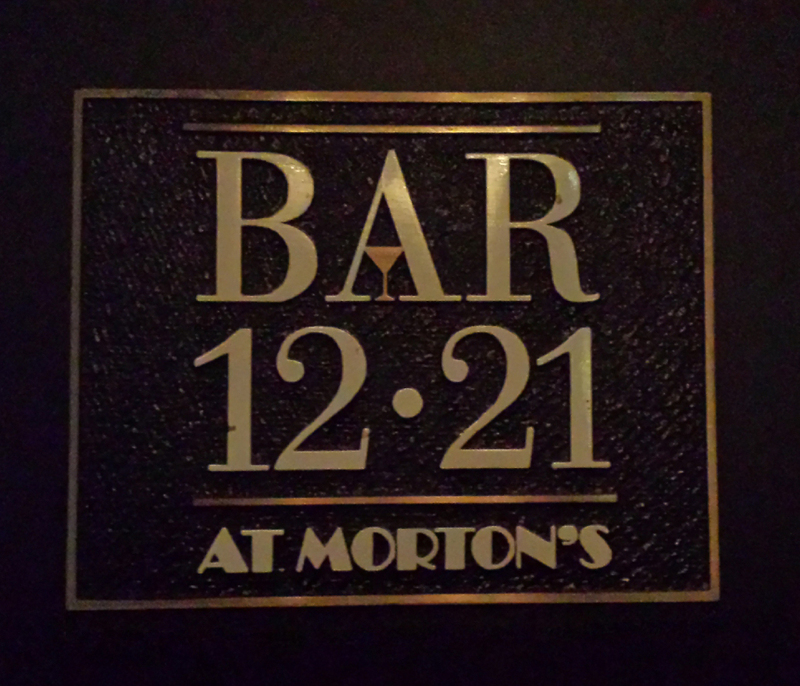 I’ve been to Morton’s twice, and both times I was extremely pleased with the flavor. They seem to cherish the meat, and they know just how to prepare it to maximize and enhance the natural flavor of the beef. 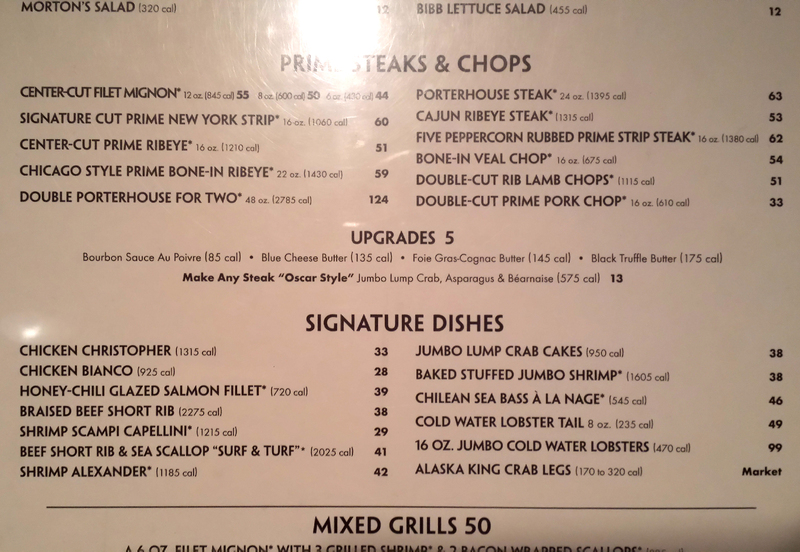 I’ve tried the rib eye, the NY strip, and the filet. I think my wife liked the filet Oskar, an interesting preparation of the filet. 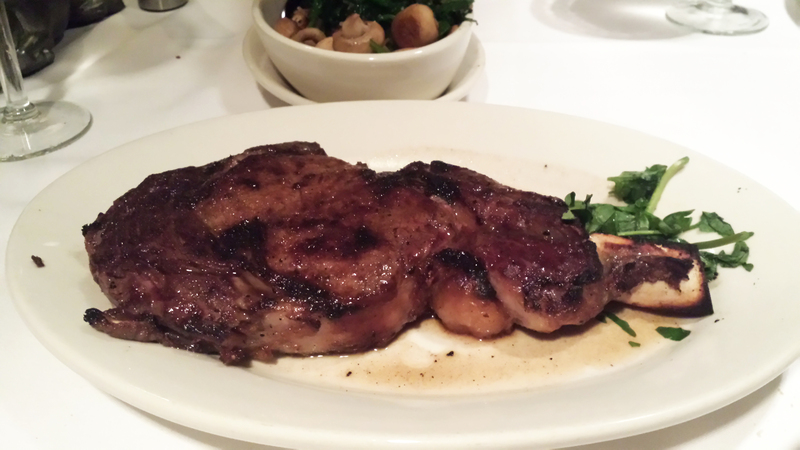 Here are some shots of the 22oz Chicago bone-in rib eye – perfectly cooked, very juicy. The only issue was that there was a bit of bleed-out, and the steak had a wet appearance, as if not seared hot enough or rubbed with enough spice to form a crust. The main four cuts (strip, filet, porterhouse, and ribeye) are all represented on the basic menu, however they really only offer those four in terms of beef, varying them slightly in size to accomodate different appetites (double cut, single cut, petit cuts). Other meats are represented, like lamb, but no other types of beef. Only the ribeye and the porterhouse are offered on the bone (though their website pictures a bone-in “Kansas City” steak, which is another name for a NY Strip). This is common, since strips and filets are usually separated from the bone in order to serve them as individual cuts. I haven’t been here enough to assess whether they offer specials often, or vary the cuts. However I am giving it a high rating because the quality of the meats offered is exceptional, and everything is prime grade. I noticed on this visit that they had a short rib to offer as well. Nice showing! The portions are average in size, but the great thing is that there is something from each cut of meat to suit every size appetite. Plating is basic – nothing fancy. 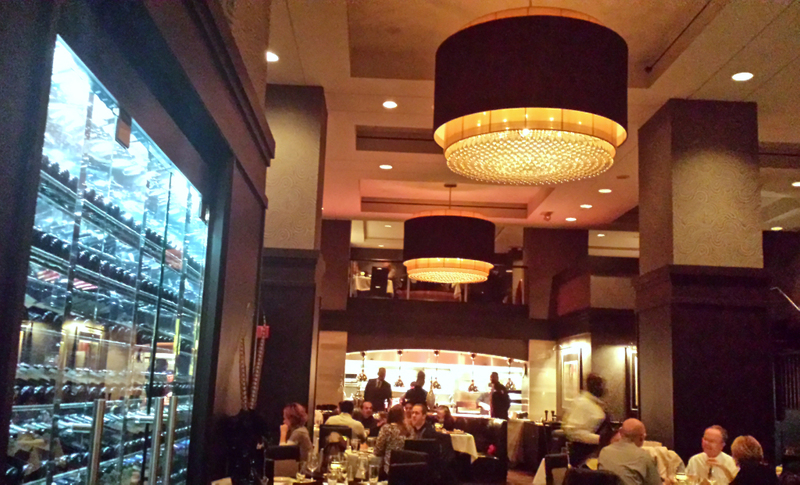 Both times my wife and I have gone to Morton’s it was during an awesome promotional period where they were offering a $50/pp prix fix menu. Portion size for the entrees and appetizers were the same as normal menu items; I think there was just a slight surcharge for the filet or the lobster, which is reasonable, and we were limited slightly on which desserts and appetizers we could choose from. Well worth the money for this kind of quality and flavor. This visit they offered a $35 three course price fix menu. What a steal! The filet was only 6oz, but it was deliciously cilantro-ish in flavor. I liked it (had a bite of someone’s). 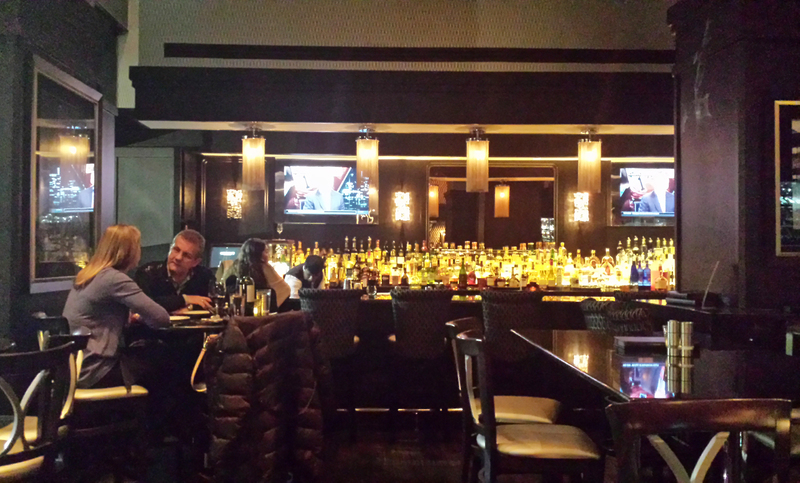 Morton’s has a really nice big bar. This is the kind of swanky, old-school place to go for some sazeracs, slow gin fizzes, and pimm’s cups. It harks back to 1920’s elegance. I don’t recall if there are TVs, but if so, this is the kind of place to go watch the Belmont Stakes if you can’t get out to the track. Other than beef, Morton’s really only offers lamb and chicken. 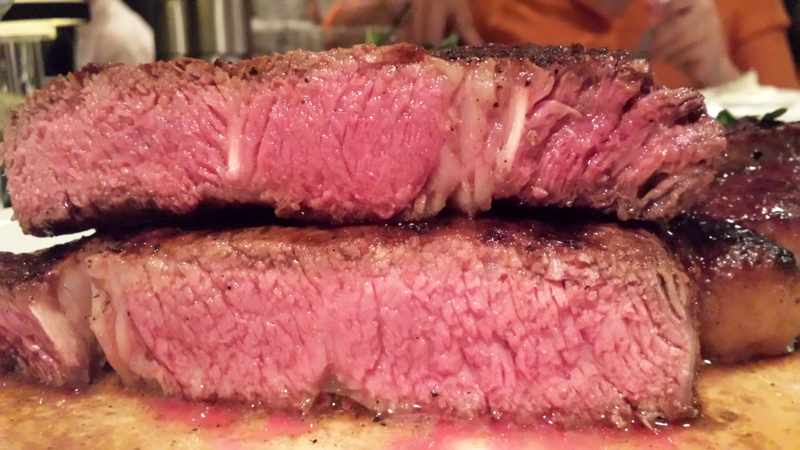 This is normal for steakhouses, since the main focus is on red meat. Morton’s strikes me as the kind of place, however, that could execute a good double cut pork chop as well, perhaps roasted or boiled with whole fresh cherry peppers; something robust and bold. They offer specials off-menu with regularity as well. 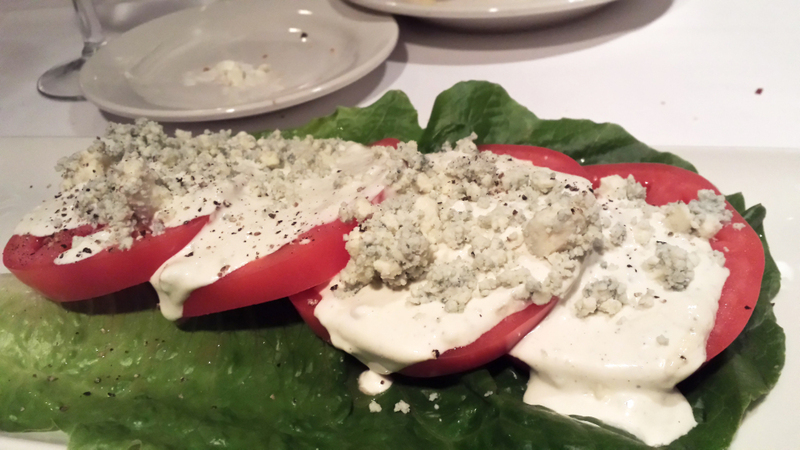 For appetizers, Morton’s offers typical steakhouse style shellfish items. We had bacon wrapped scallops, which were fine, but not amazing (the scallops were cooked properly, but the bacon wasn’t crispy enough for my liking). We enjoyed the shrimp alexander, however. The crabcake was above average, and I vaguely recall my wife trying the 5-onion soup and liking it very much. 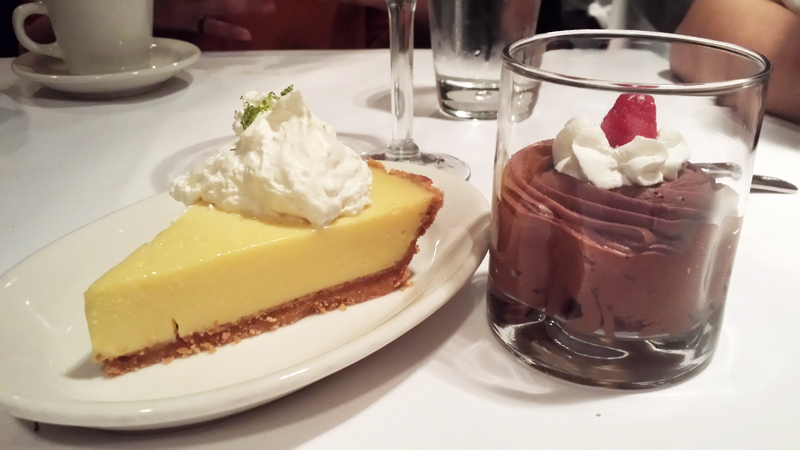 Sides and desserts were average to above average. We were slightly limited in what we could choose since we were eating off of a prix fix menu, so I have not deducted points based on an incomplete review. 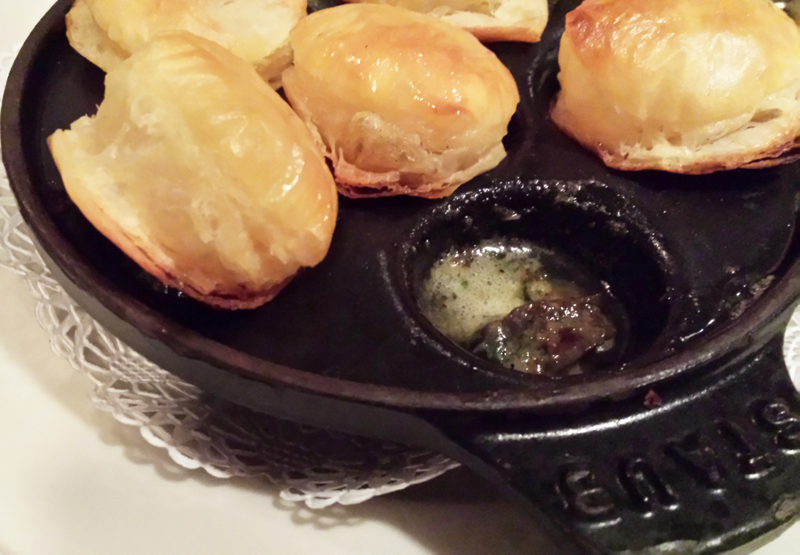 I would imagine the Oysters Rockefeller are wonderful. 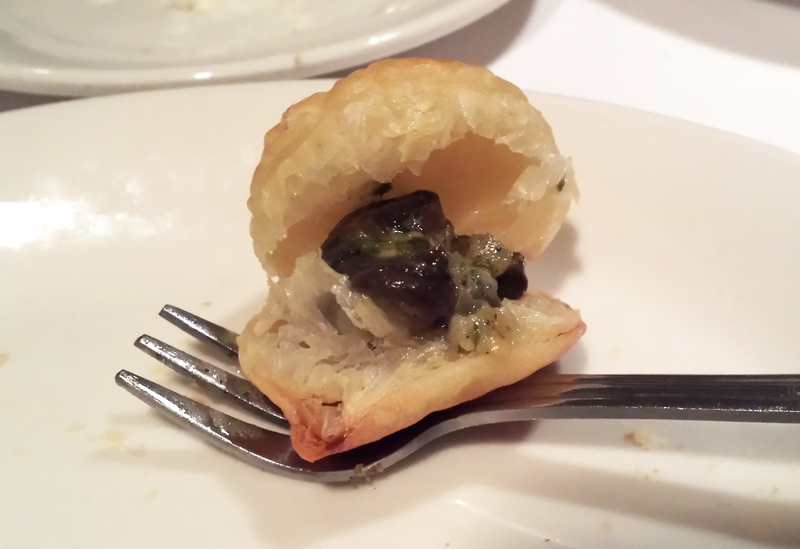 On this visit we tried the escargot to share. 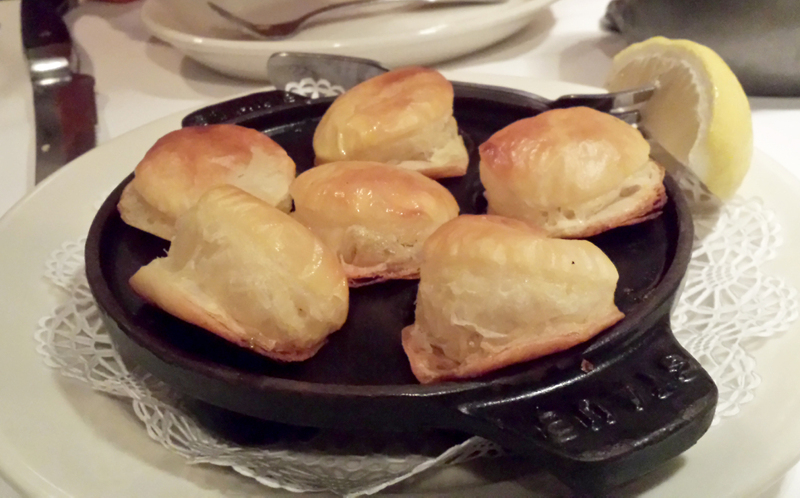 They were great, buttery yet light, and no funky taste – better than the ones I tried at Les Halles downtown. 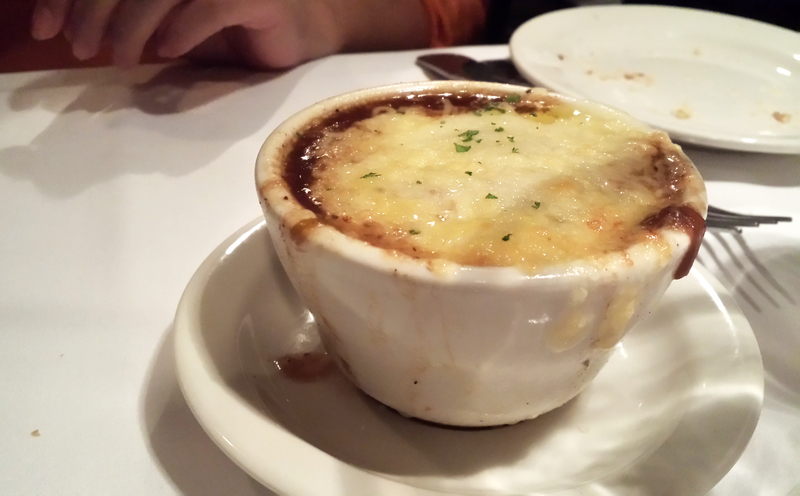 My wife had a cup of the five onion soup with her $35 price fix deal. I tried thinking of five different onions in my head but not sure if shallot counts as an onion. This was great, by the way. Really flavorful but not too salty like many onion soups can be. Deftly prepared. The price fix entrees came as a composed dish with a small side as well. 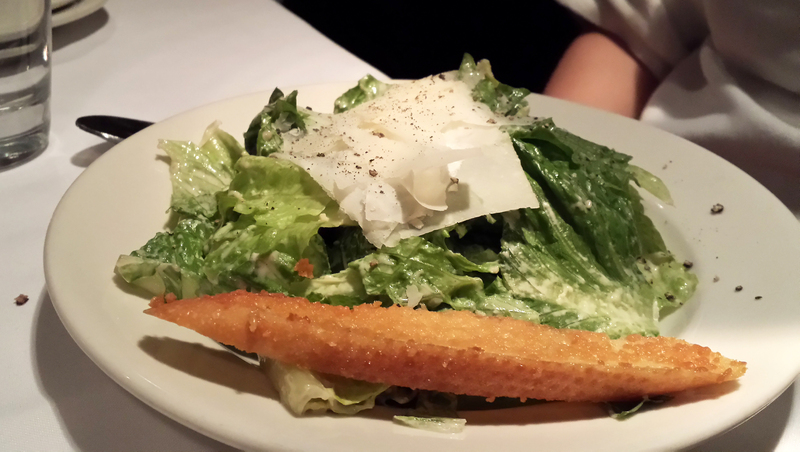 My wife chose the horseradish garlic mashed potato item, but I didnt like it so much. I didn’t taste any horseradish, and the texture wasn’t creamy enough. 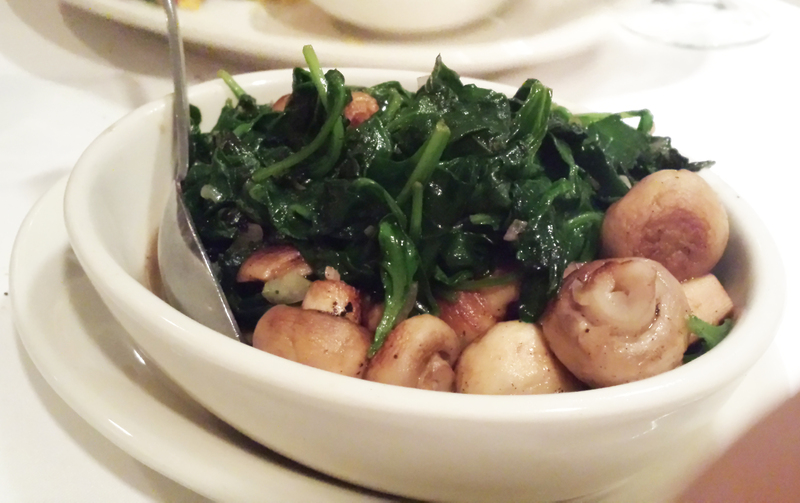 However the side I ordered was sautéed spinach with button mushrooms. I originally wanted to try the creamed spinach again, but they were out! WHAT?!??! We surmised that it must be a pre-prepared item of some kind, or they simply ran out of the right cheese and cream. Bummer. But this was really good anyway. For dessert I tried some of the ladies’ price fix items. Key lime pie was creamy and smooth with no bitter aftertaste, on a great graham cracker crust. The mousse was nice too, but I’ve had better. 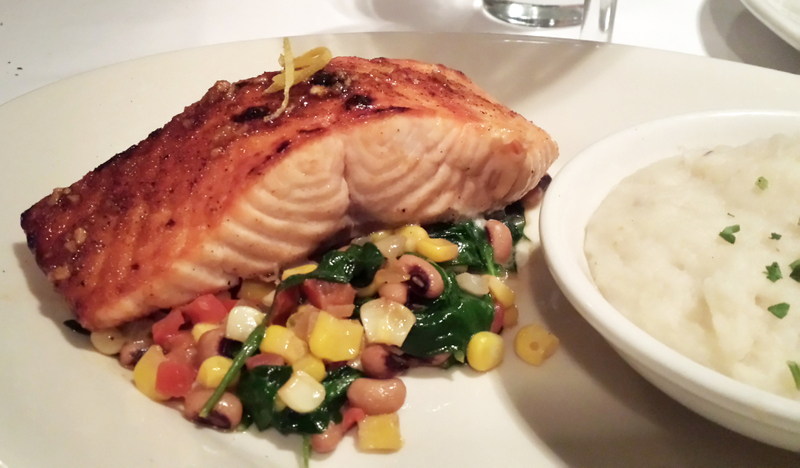 I’ve never tried Morton’s seafood entrees, but they offer salmon, sea bass, and a few basic variations of both lobster and shrimp. I tried a bite of my wife’s salmon entree and I was blown away by how good it was, so I bumped the score up a bit here. 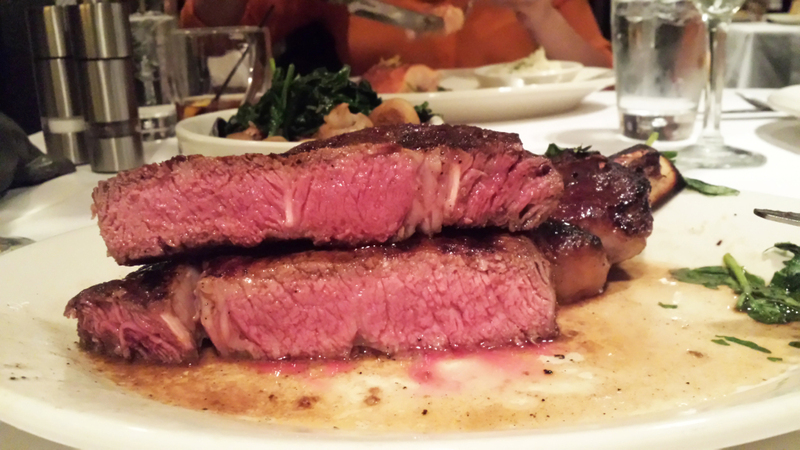 It was a perfect medium rare, very flavorful and juicy, and a great portion size for the $35 price fix. 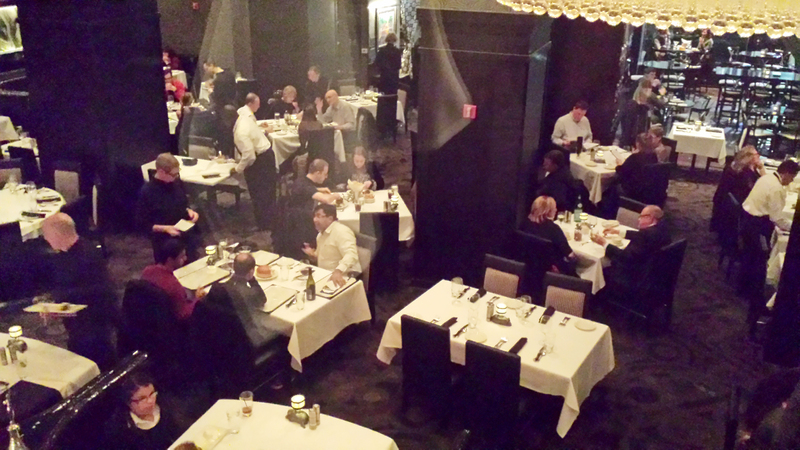 The staff at Morton’s are trained to display sample cuts of beef to every table before patrons order their meals. While you are snacking on the delicious onion rolls in the basket of table breads, the waiters will come by and explain each cut of beef, physically pointing at the meats under plastic wrap on a display platter. Drink refills and general attentiveness was great, as expected. 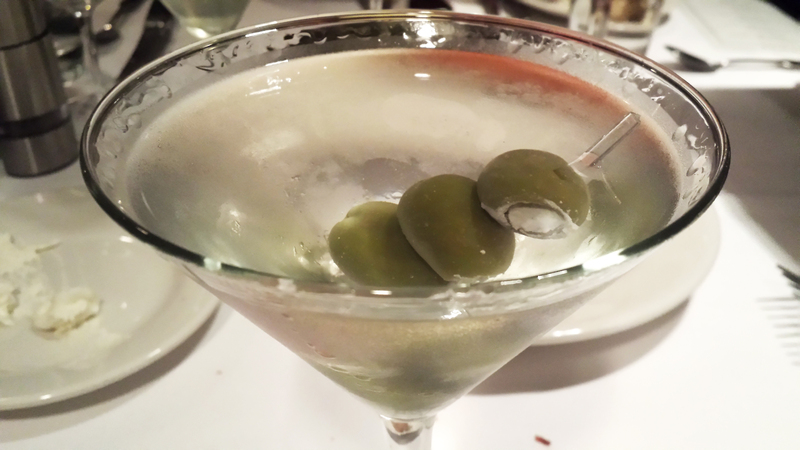 Occasionally my wife and I will make birthday or anniversary reservations online, and, if you tell Morton’s it is your birthday or anniversary, they will do something special. On out first visit, for an anniversary, they had a photographer come by and snap our photo, which they then gave to us in a cardboard “Morton’s” frame. On the second trip, also for an anniversary (a year later), they printed a special menu with our names on top, and gave us a complimentary cake dessert. 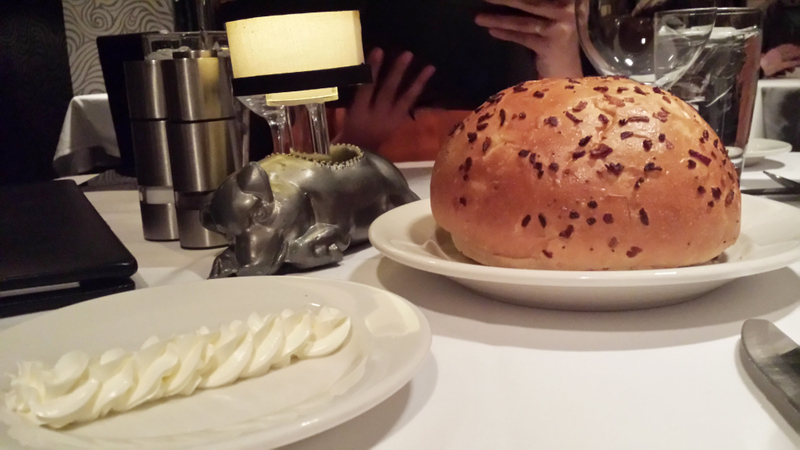 The bread basket switched to a large loaf of warm onion bread, with a line of soft creamy butter. Also, there was no longer a display plate of the steaks. I liked that bit of service professionalism. Oh well. Morton’s definitely has a 1920’s feel to it when you step inside. It is set up with a large, high-ceiling, art-deco inspired dining room on the main floor, which features the impressive bar. In the rear there is a stairway to a smaller elevated dining room that overlooks the main dining room. Walls in both areas contain authentic photos of famous people who have eaten there. The crowd is a mix of tourists, businessmen, and Manhattanites. Bathrooms, flatware, and silverware are clean, and the music is a mix of jazz and typical dinner music. While the layout is still the same, the photos are gone now and were replaced by a trippy, squiggly, semi-modern wall paper. I liked the old decor a bit better so took a point away here on the re-review. In any event it is still a very cool space.